– Becky Lynch’s trolling game in her feud with Ronda Rousey is constantly finding new levels, and a recent one involved Rousey’s Funko Pop! vinyl figure. Collectables store Heroes Hideout in Albany, New York shared some Pops earlier this month that were signed by Lynch — except they were Rousey’s. The post is no longer available, but Sportskeeda has a screenshot, which you can check out below. 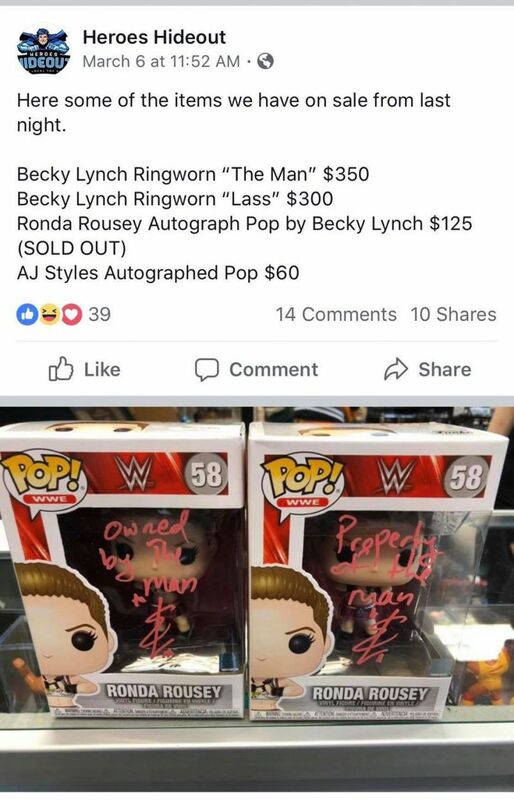 Lynch signed the pops “Property of the Man” and “Owned By the Man” along with her signature. Lynch got her own first-ever Funko! Pop this week. However, there’s no chance for Rousey to return the favor before WrestleMania as Lynch’s Pop won’t release until August.